She’s Persistent, that Holy Spirit! My life has felt like a series of “coming outs.” I came out as queer in high school and to my disappointment, no one was surprised. It felt like the longest crescendo and I was finally going to share my truth! Come to find out, my gender expression and sexual orientation had about as much volume as Uncle Jesse’s hair on Full House. I attended Concordia College in Bronxville, NY, and it was there that I was given the space and freedom to figure out what my sexuality meant to me and how I was going to move through the world as a queer Iranian-American woman; very a-la Felicity. For as long as I remember I could feel a call towards serving others but didn’t know how to reconcile that internal call with the rules of the church. It was like I was Moana on the Island of the LCMS. Margarette preaching at Grace Lutheran in Scarsdale, NY. In 2007 when I changed my major from Liberal Studies to Social Work, I flourished. I had found the answer in a world where I couldn’t be a pastor let alone be “out” and also serve the church. I received my Masters degree in Social Work, volunteered at a camp for children with congenital heart defects, and landed what I thought was my “dream job” working with chronically and terminally ill children. I was the Leslie Knope of pediatric palliative care! Still, I continued to feel a nagging toward ministry – it felt like the sound of Janice’s voice when she sees Chandler Bing, except all of the time. 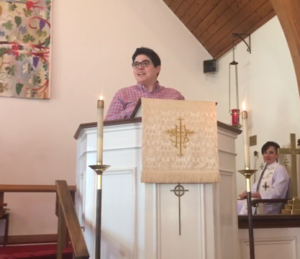 I remember typing into my search engine, “LGBTQIA+ female pastors in the Lutheran church.” After a few clicks around I found Proclaim and a wave of relief came over me. There was a community that could support me and recognize the gifts I had to offer the church! I reached out and started on a path of discernment that has lead me to sharing this story with you. I was raised Agnostic with Catholic and Muslim grandparents and while I found sanctuary in my observations of their faithfulness, this made my being called to Word and Sacrament in the Lutheran church delicate to navigate. This second coming out gave me the reaction I was looking for in my FIRST coming out! My family was initially, and continue to be, shocked and confused. I heard questions like, “I didn’t know you were religious.” “Why Lutheran?” “Can you be a gay woman and a pastor? 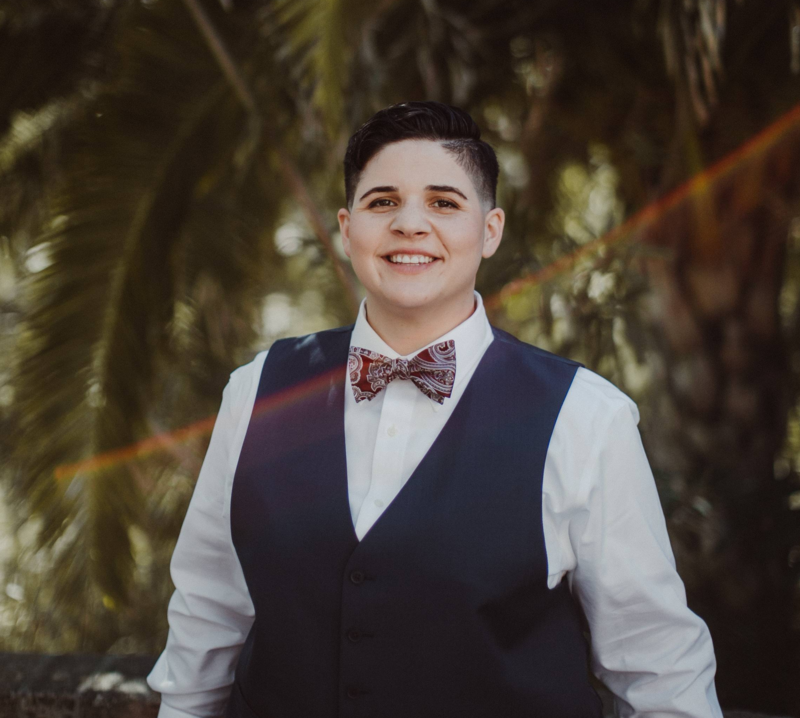 How?” “Why do you use the word queer?”; I have answered more questions around my call to ministry than when I came out as queer. Looking back, it was the the Holy Spirit that continued to pull me back to church and back to God’s word. She continues to give me strength to use my voice to proclaim the gospel. Her light shines on my gifts for the church and She’s showing me how to use them in service to others. She’s persistent, that Holy Spirit. Margarette Ouji is a 1st year MDiv student at PLTS. She lives with her wife Abby and their adopted Shih Tzu, Luther (named for the BBC detective). When Margarette isn’t studying, you can either find her at home, crocheting and cheering on the Green Bay Packers or attempting to learn Farsi with her grandmother in Sacramento. This entry was posted on Thursday, May 24th, 2018 at 11:42 am	and is filed under Blog. You can follow any responses to this entry through the RSS 2.0 feed. Both comments and pings are currently closed. Margarette is a wonderful example of when Christ’s light shines through a beautiful vessel. Her story speaks to warmth, genuineness and triumph. Her authenticity rings through her words and laughter. I am so very proud to have been part of her social work journey and even prouder to now stand beside her in Christ’s family. Speak His truth and know you are loved!